With just over a week to go until Christmas Day, now is the time to make sure you’ve got all your gifts sorted and start finalising stockings and wrapping them up! 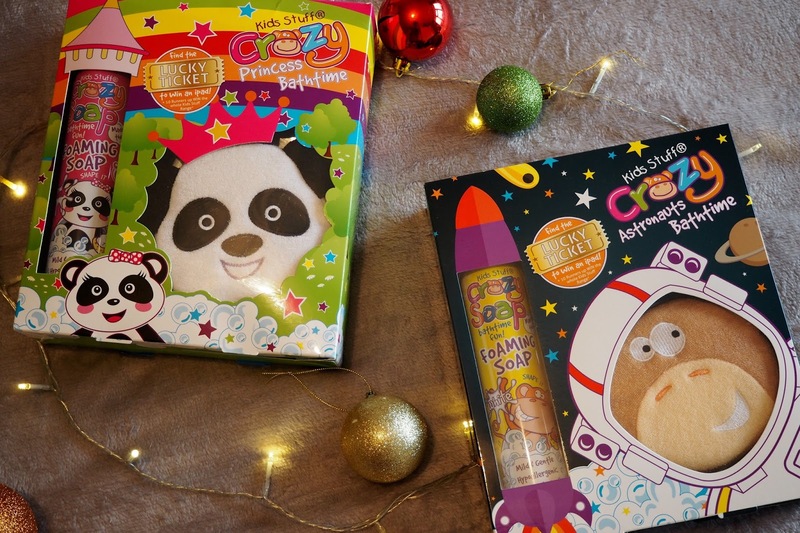 I’m quite pleased to say that I finished this week and just have a few more things to wrap for Millie and a couple of stocking treats to get for Adam - but if you’re still powering through and struggling for what to buy everyone, take a look at the ideas below. 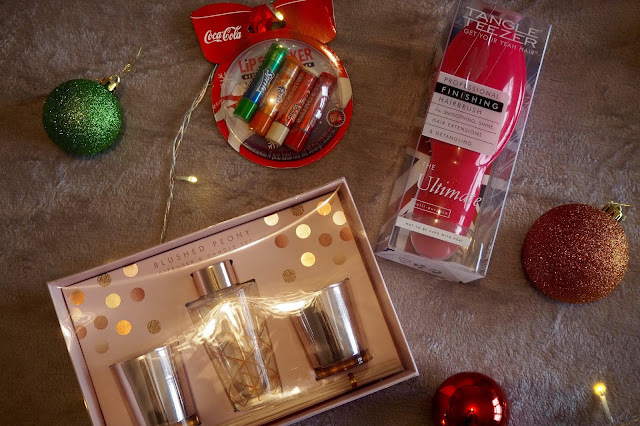 With gifts ranging from £1+ there will definitely be something for everyone that’s on your Christmas list. 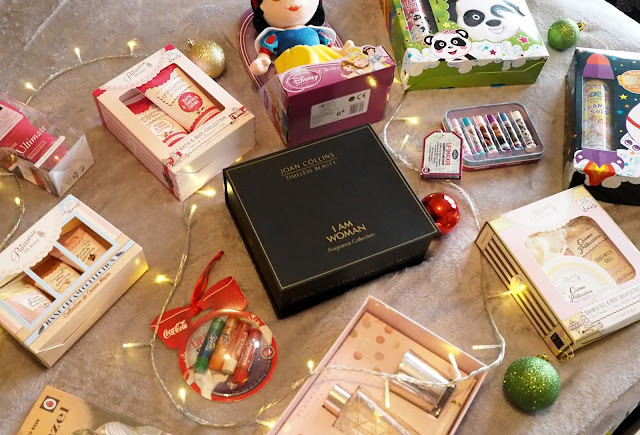 From beauty gifts to home, bath products and toys - you can count on these ideas to help you finish the last of your Christmas shopping and better still, the majority can be bought online! 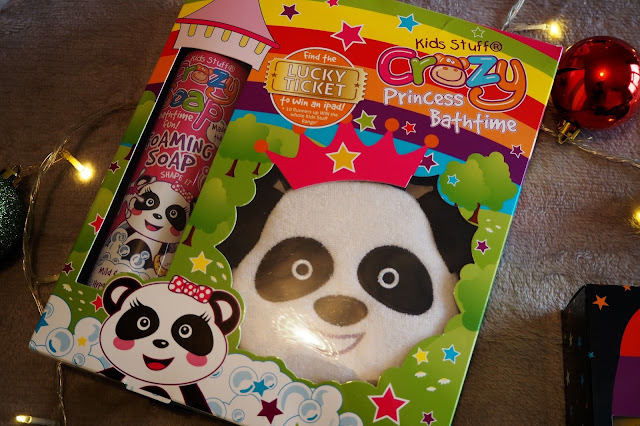 There are a couple of items in here suitable for children - right from around 9months old. 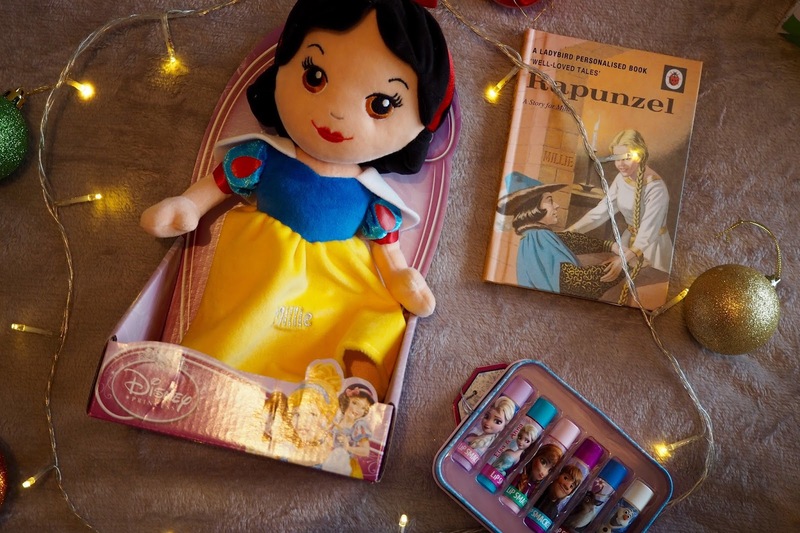 I always find kids are the hardest people to buy for as you never really know what they already have at home or what other people have bought so I think that these picks will make sure that your gift stands out and it won’t break the bank either. 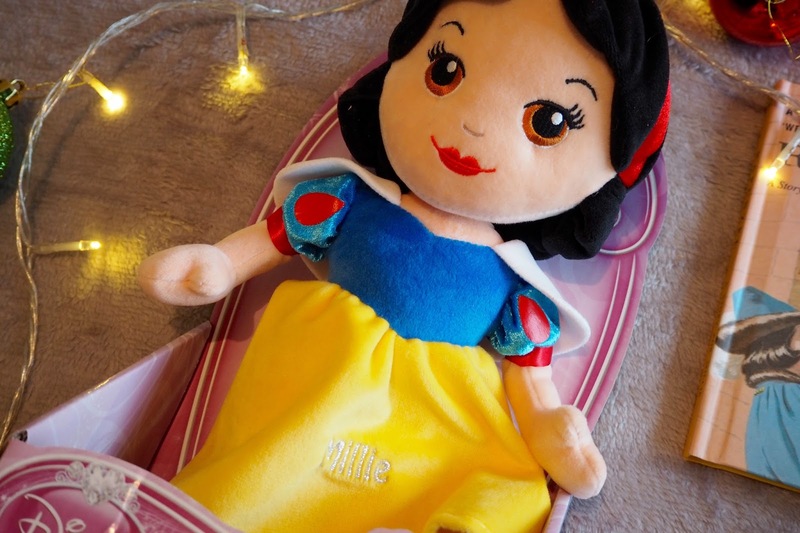 For any Disney lovers, these personalised gifts are perfect for Princess lovers which make them a little more unique and individual than just buying from the Disney Store or other places. 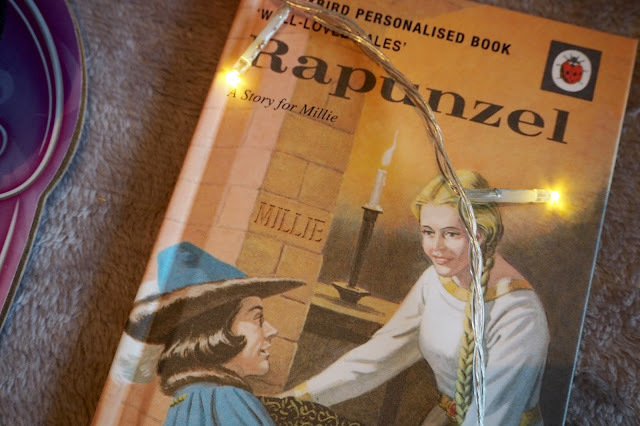 This personalised Rapunzel book (£12.99) is a Ladybird original but personalised for Millie so throughout the book, she can look out for her name in the pictures and it also has her name on the front too! And this super cute Snow White doll (currently on offer for £14.99) has her name beautifully embroiled onto Snow White’s dress, again, making it just that little bit more unique and individual. You still have 2 days left for Christmas delivery from I Just Love it too! If you’re still struggling buying Mums, Sisters, Nans or Aunts gifts this year, look no further. 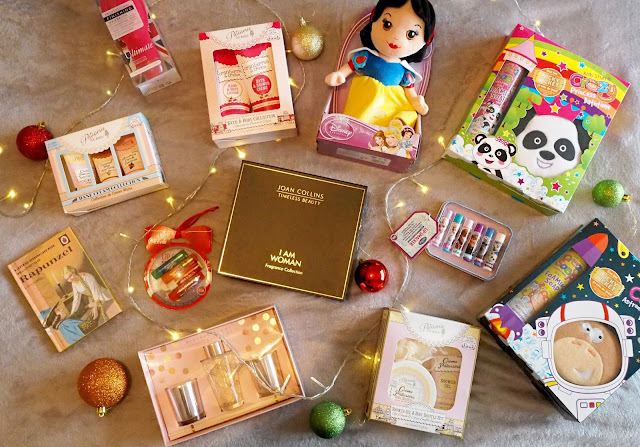 You may have seen that Soap and Glory released their Star Gift this year which was this gorgeous tin suitcase style gift which was full of £78+ worth of S&G Bath and Beauty products for just £30.00. Like usual, this has now sold out online on both Soap and Glory and on Boots but it may still be available at full price of £60.00 in some Boots stores so pop into your nearest and double check. Failing that, Soap and Glory also have lots of other small gift sets that are perfect and can be combined in Boots’ 3 for 2 offer too! If you want something a little more in particular but still quite luxourious, then Joan Collins Beauty is a great place to start. 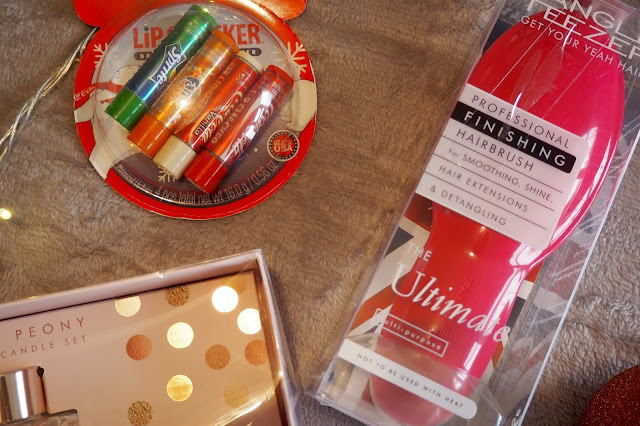 I have a few of the makeup bits and it’s brilliant quality - the lipsticks are perfectly creamy and pigmented and I actually quite like the fragrance too. 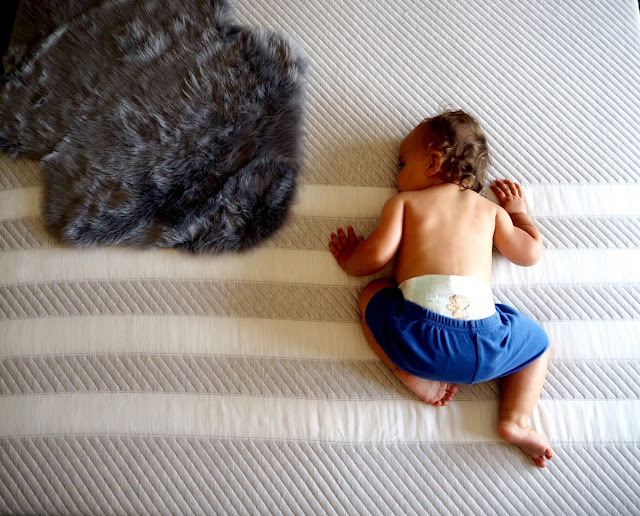 Although you may think it’s aimed at older ladies, it can be used by all ages regardless. 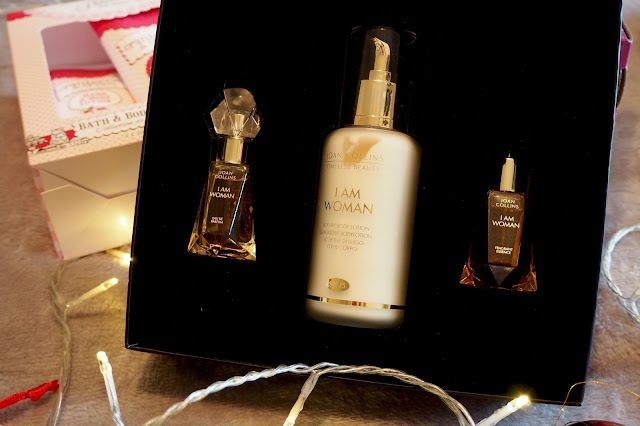 This Fragrance gift set (£45.00) includes a Body lotion, Eau de Parfum and a small bottle of Essence. The fragrance is very feminie embracing citrus top notes, a sensual musk and woody base and romantic floral scents at its heart. It’s the perfect gift for Mums! 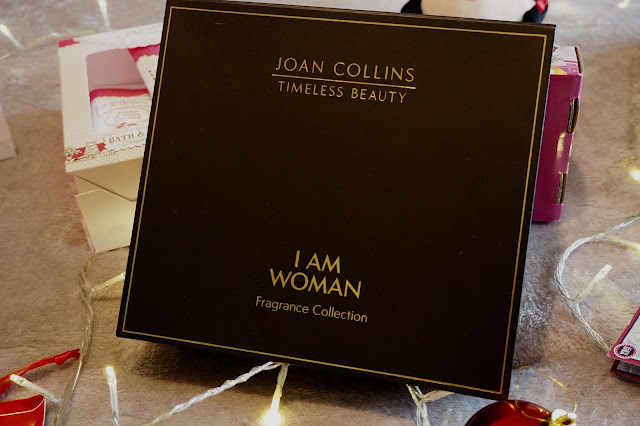 You can order it direct from Joan Collins Beauty or Marks and Spencers have a similar gift set that includes a perfume and a reed diffuser (£32.00). If you’re on more of a budget this year or have quite a few people to buy for then take a look at some of these cracking (see the pun?) ideas to help keep you and your bank balance happy. 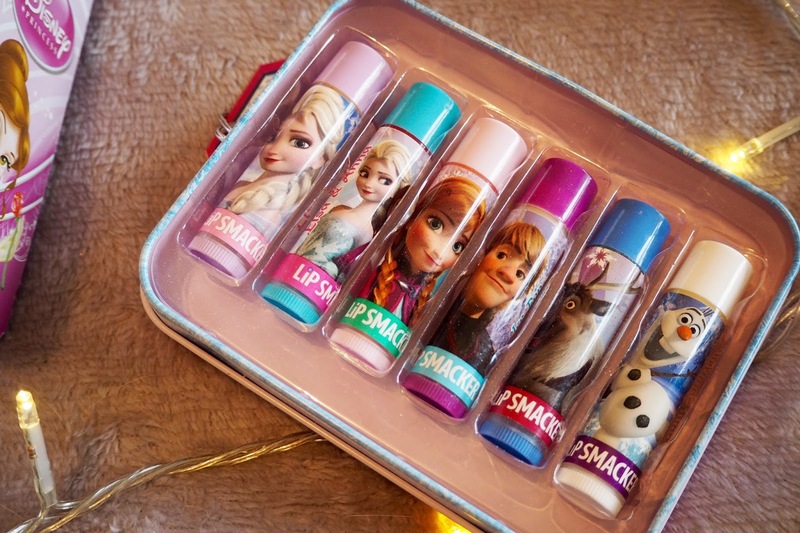 Similar to the Frozen Lip Smackers mentioned above, you can get a Fizzy Pop Lip Smacker flavoured set in this cute little Christmas Decoration style gift (£8.00) which is perfect for teachers, secret santa or stocking fillers! This Rose Gold home gift set is also another perfect, budget friendly gift for friends or teachers and believe it or not.. this is from Home Bargains for just £3.99! If you want something a little more specific, this Tangle Teezer Ultimate de-tangling brush (£15.00) is a gift that any lady or little girl will love. 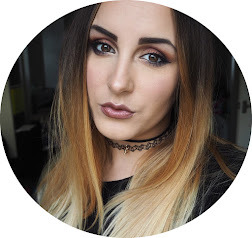 Better than the original, it has a handle which makes it easier to grip and brush through tangled hair and the colour just adds that little bit of brightness. You can buy this direct from Tangle Teezer or from Boots if you’re heading into store! 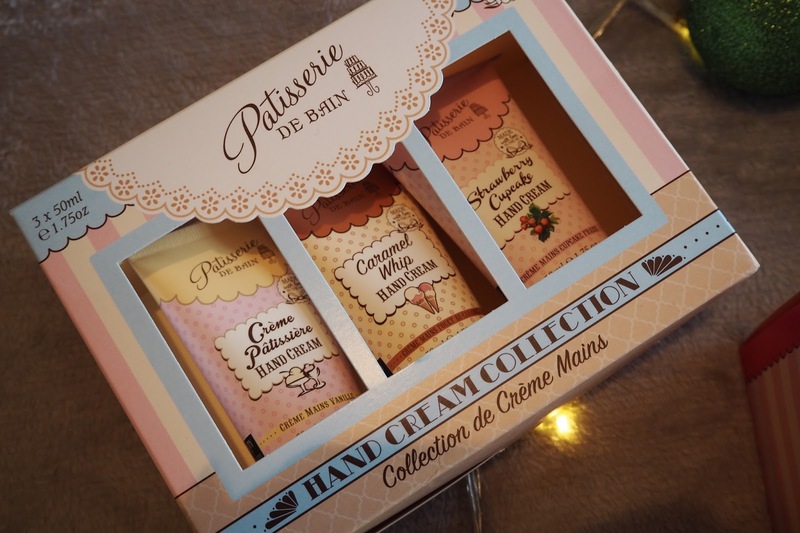 And if you’re looking for something a little more delicious, these gift sets from Patisserie de Bain at Superdrug are super affordable and smell amazing! All 3 of these sets were just£1.00!! 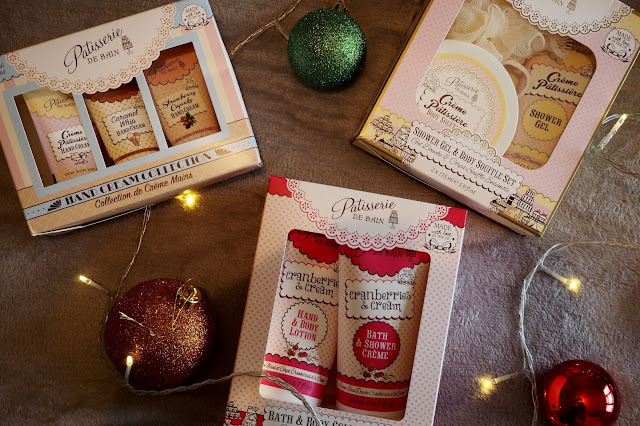 Including the Trio of Hand lotions, the bath and body set and the Cranberries and cream bath set. So there’s no excuse not to say thanks to your best mate for looking after the cats or cheers to your favourite teacher for putting up with you all year! Oxfam are working hard this year to give gifts to those who are in need of the things that potentially, won’t be on our christmas lists this year and I want to make sure that all the Mums and Babies out there are given the gift of Care. 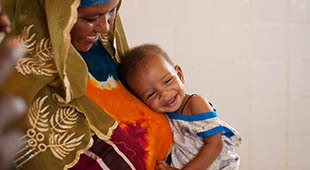 Simply working with Oxfam this Christmas, you can give the gift of Care to Mums and Babies (£16.00) to ensure they’re healthy and well and getting the treatment they require this festive season. It will help train community doctors and midwives and give access to safe water for Mums and newborns too. There are other gifts you can give too including Soap, Feed a Family and even a pile of Poo and all you need to do is head over to Oxfam Unwrapped, choose your charity gift and pay for it! choose your gift and pay for it! There are a few that are on offer too at the moment so if you have some spare pennies left over from all of your Christmas shopping, please consider buying one of these gifts and potentially changing someone else life, not just their Christmas. A gift or a present is an item given to someone without the expectation of payment. An item is not a gift, if that item, itself, is already owned by the one to whom it is given. Although gift-giving might involve an expectation of reciprocity, a gift is meant to be free. In many countries, the act of mutually exchanging money, goods, etc. may sustain social relations and contribute to social cohesion. Christmas (throughout the history of Christmas gift giving, people have given one another gifts, often pretending they are left by Santa Claus, the Christ child or Saint Nicholas). Refer essay writing service reviews to get reviews of various online writers.